At around 8 o’clock on Saturday morning – just over 12 hours since we left Catania - we get our first distress call. We hear that around 300 people are drifting without power, and in need of rescue. 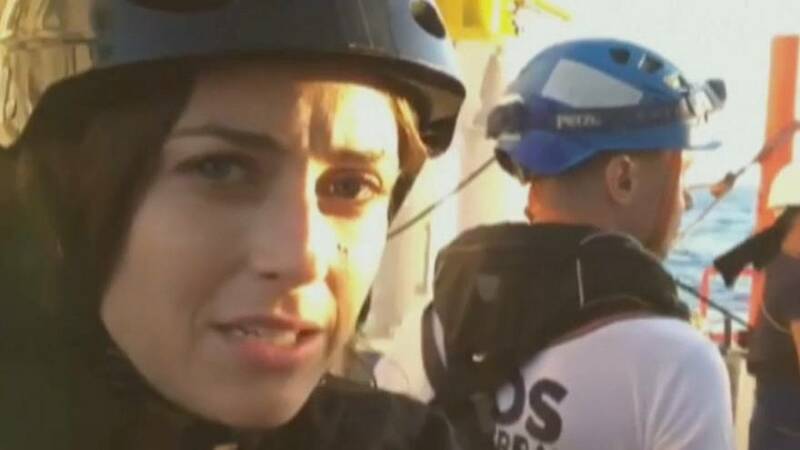 Euronew reporter Anelise Borges says, “We’re just a few minutes away from rescue and the boat is going to be loaded on the water and we are expecting to find some one hundred, or one hundred twenty people onboard this boat that is in distress”. At this stage, it all seems very orderly. The first few people are loaded onto the lifeboat. We head back to the Aquarius with our first refugees. We head back again. Now the light is fading. And the atmosphere is changing. The refugees are becoming worried. Max knows it’s important to reassure them. The volunteers have to work quickly. As Max hands out more life jackets, several people suddenly make a grab for our boat. There’s a risk that we could be overturned in the commotion. The refugees are now starting to panic. Max can see that the side of the raft is giving way. Several people have fallen in. In the pitch black it’s impossible to see how many people are in the water. Once again there is a risk our lifeboat could be overturned. We’re forced to back away from desperate drowning people. The rescuers are doing their best to keep control of the situation. Over the next three hours our lifeboats shuttle repeatedly between the two rafts and the Aquarius. 219 people are rescued. It’s only later that we find out…2 refugees have drowned. There are entire families, seven pregnant women, young children and over 120 unaccompanied minors. After seven gruelling days on board, land is finally in sight. Anelise Borges says, “This is it. The sight that they have longed for days. They are this close to reaching Europe, to start this promised life”. Reward is an Asylum Seeker and he says, “I’m a little bit nervous actually. We thought all hope was lost but you guys received us and our hope was again”. The joy and relief of stepping on dry land soon give way to emotional goodbyes. Bonds of friendship have formed between the volunteers and the migrants. Reward is the last one off the boat. From this moment, he and his travelling companions are asylum seekers. They are setting off…on a new journey.